Cold Pressed Raw Cacao and Goji Berry flapjack bar, Free From Gluten, Dairy, Wheat, Soya and Peanuts. 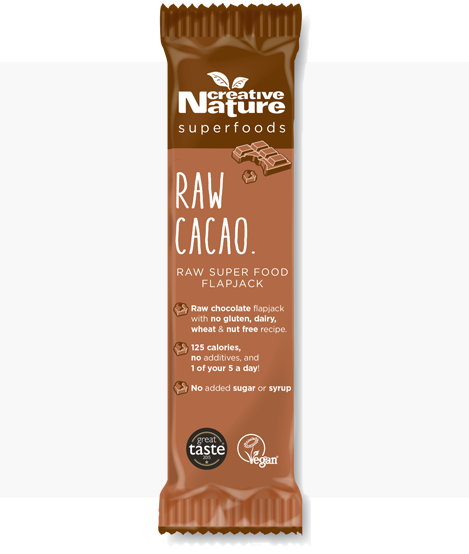 Cacao Bar – The Creative Nature Raw Cacao Energy Flapjack Bar contains a number of healthy minerals, including magnesium, potassium and iron, which are destroyed when heated into commercial chocolate bars. 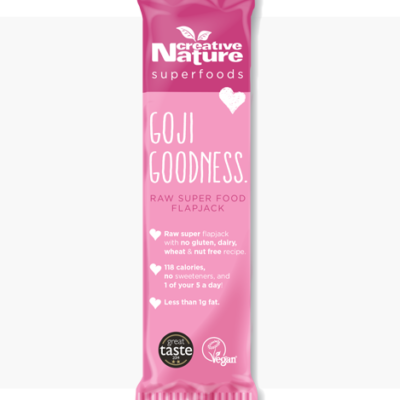 That’s why we’ve cold-pressed this bar to retain all the vital nutrients and we’ve also added some extra Superfoods to further boost the nutrient content like Vitamin-rich Goji Berries and Calcium-rich Maca Powder. With a dreamy Cacao flavour, it’s no wonder Raw Cacao is a Winner of 1 Gold Star at the Great Taste Awards. Creative Nature Raw Cacao Energy Flapjack Bar is the dream bar of all Choco-holics out there! It is full of Cacao Powder, Nibs as well as Maca and Goji berries, meaning the flavour of Cacao is beautiful and delicious yet still lovely and sweet! It is a raw, vegan, dairy free, gluten free and nut free bar meaning it accommodates to pretty much all possible diets and allergies! Whether you want to treat yourself to a mid-day pick me up or a delicious pre-workout snack, these bars have you covered. They are also a great topping for smoothie bowls if you are a fan of having some tasty and beautiful bowls in the morning! Not only do they taste incredible and provide you with a great bit of energy, but it has no dates, syrups, agave, artificial sweeteners or sugar, making them healthier than most of the bars out on the market today! So unbelievable yummy! 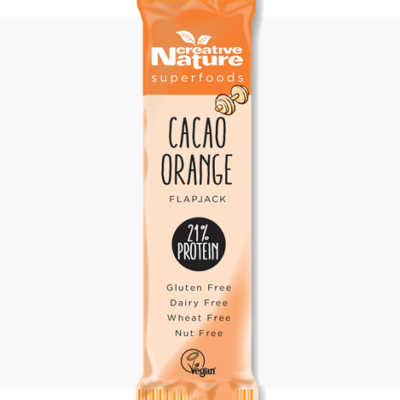 Can’t recommend this enough as it fulfils your craving for something sweet and chocolatey but is obviously far healthier for you. I’m an athlete and I found that the bar was filling enough to give me a boost of energy during a training session but without sitting too heavily on my stomach….a must have!